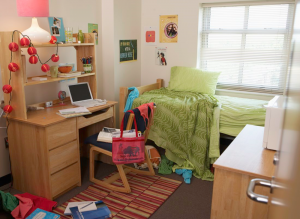 College kids have a lot of valuables in their rooms – keep them safe! The most common crime your kids are likely to face while at college is theft of their personal property. Students today take far more valuables to college than their parents’ generation did. Smartphones and laptops are standard school supplies for today’s student, and they are pricey tools that would need to be immediately replaced if theft occurs. Campus security authorities recommend that students be aware of how they can prevent a loss from occurring. Keep valuables hidden – put away your phone or laptop when you aren’t actively using them. Keep jewelry in items designed to disguise their contents, such as safes that are designed to look like books. Better yet, don’t take valuable or especially sentimental jewelry to school with you. Lock it up – use an anchor lock system to tether your laptop in place if you need to step away from it momentarily. Use sturdy U-shaped metal locks to secure bicycles on racks. Form the important habit of locking your door behind you, even if you just plan on being briefly away from your room. Register your items – colleges offer systems of registering your laptops or bicycles within a secure system that tracks possessions with sophisticated bar-coded stickers that can easily track ownership of items. These serve as a deterrent to theft. Despite efforts, some theft of personal belongings could still occur while your child is away at college. Find out if your homeowners insurance will respond to a loss that takes place while your child is living away at school. If your policy will not cover these items, a renter’s policy may be the best way to protect your child’s valuables. How to Deal With Road Rage: 5 Dos and Don’ts Insurance and the Uninsured Driver – Is Umbrella Insurance Really Worth It?